Rodman will lead the team that includes former NBA All-Stars Kenny Anderson, Cliff Robinson and Vin Baker. Craig Hodges, Doug Christie and Charles D. Smith are on the team, as well. They will play against a top North Korean senior national team on Wednesday, marking Kim Jong Un’s birthday. Rodman said his trips would not be affected by the recent execution of Kim’s uncle. ”Dennis and I are total opposites, but we work very well together,” Smith said. ”Dennis is one of the few people I know that doesn’t just talk but actually lives a culturally diverse life. We have traveled everywhere together, so I was not surprised with his first visit to North Korea. 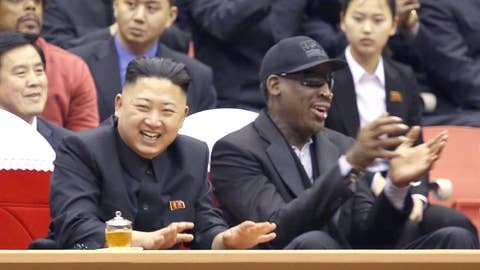 Rodman has been criticized for not talking about North Korea’s human rights record, described as one of the world’s worst by activists, the U.S. State Department and North Korean defectors. The defectors have repeatedly testified about the government’s alleged use of indiscriminate killings, rapes, beatings and prison camps holding as many as 120,000 people deemed opponents of authoritarian leader Kim Jong Un, the third generation of his family to rule.